Some believe. Some don’t. Most are ambivalent. Since the incidents at Roswell, the number of people claiming UFO sightings has steadily risen. And those who believe UFOs are of extraterrestrial origin represent a large majority. 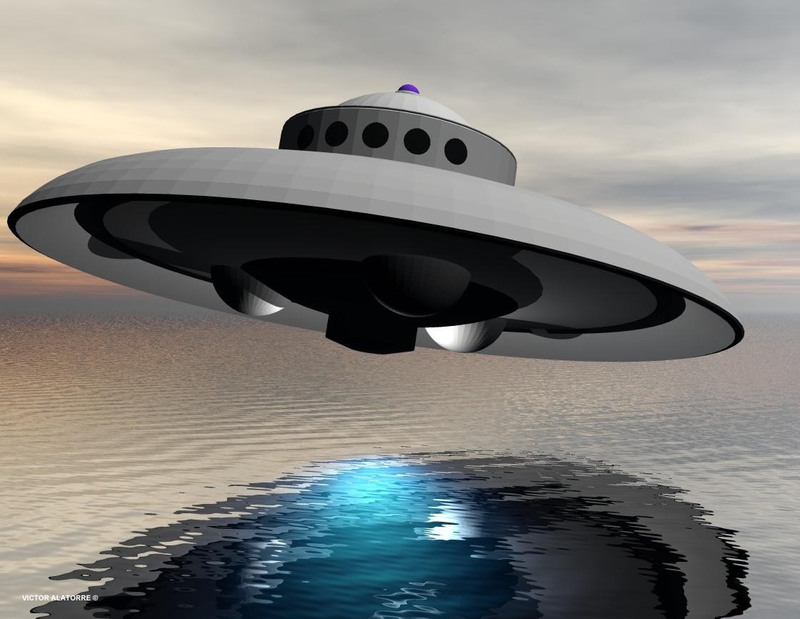 Simply Google the word “UFO” or “ET” for a more-than-generous take on the spectrum of speculation: Pseudo-intellectuals who examine the facts, and insist on 3-dimensional evidence which may or may not be relevant. Hard-core skeptics, who believe these questions can (and/or should) only be answered through science and astronomy. Conspiracy theorists who accuse the government of shrouding evidence of Extra Terrestrial life in secrecy to protect some hidden agenda. The Spiritual realm has its own theories. Many fundamentalist religious folk deny the possibility of ETs all together, believing the Bible’s account of cosmology and creation to be literal and complete – the totality of all that is. Those God-fearing Church goers who do believe ETs exist, have their own take on what these beings actually are. Angels? Demons? Or, as Chuck Missler, speculates, a hybrid race of fallen angels and humans, the “giants” (or Nephilim) referred to in the Old Testament. This view postulates an ultimate conspiracy of the dark side to contaminate our genetic gene pool by creating a bastardized blood of rebellion to ruin God’s creation of man. Non-traditional spiritualists offer a variety of hypothesis: Many have claimed contact with ETs as guides and claim to channel beings from star systems such as the Pleiades and Arcturus. In this viewpoint, ETs are not looked at as a single entity with a distinct agenda, but rather, multi-dimensional beings throughout the galaxy, that, like humans, are both dark and light, some benevolent, some not. In this paradigm, the realms of the Universe are too vast and varied for a single label or category. ETs are not looked upon as “good” or “bad,” evil or divine, but simply, diverse. Some are here to help the planet involve, some have their own agenda. It is a realm where much discernment and understanding is required. According to many extrasensories and channelers, there are not one or two ET races, but literally thousands of different species with histories and cosmology as mysterious as Earth itself (and often, inextricable tied to Earth’s narrative). Regardless of the paradigm any believer (or non-believer) comes from, this book takes on the big question: If there is ET life, how would global contact change our world as we know it? Creatively combining historical analysis and science fiction, A.D. After Disclosure sets-up the “what if” questions with fictional scenarios, while critically exploring the political, social, and cultural implications of contact. 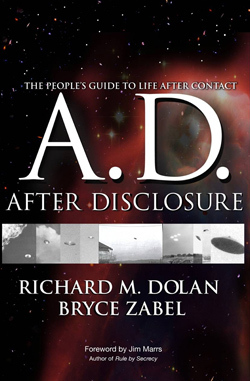 Regardless of your take on the possibility of Extra Terrestrial life, A.D After Disclosure opens up the debate, and offers thought-provoking ideas on entanglement. Skeptics and non-believers will have fun with this Hollywood style exploration, while UFO enthusiasts can tap into a plethora of directional possibilities. Either way, it’s a thought-expanding read. “Richard M. Dolan is the author of the ground-breaking historical series, UFOs and the National Security State, which chronicles the modern UFO age with an emphasis on military encounters and government secrecy. 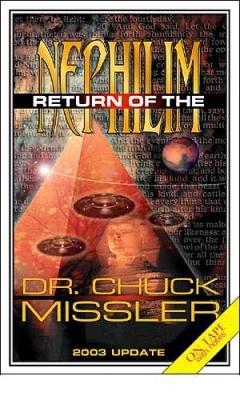 This work has been acclaimed as the finest history of the UFO phenomenon available in any language. Dolan has also published articles, spoken at conferences around the world, and appeared on numerous TV specials as an on-air expert. He has developed fresh insights into the practical challenges and opportunities for a true disclosure of the UFO phenomenon. “Bryce Zabel has created five primetime network series, notably NBC’s Dark Skies, to be released on DVD in 2011. 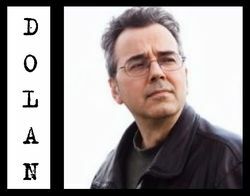 He also wrote and produced Syfy’s first original film,Official Denial, about Majestic-12, and worked on the development team on the Spielberg-produced abduction miniseries, Taken. In 2008, Zabel received the WGA award for writing the Hallmark mini- series, Pandemic. He has written multiple studio feature scripts, receiving credit on two produced films, Atlantis: The Lost Empire, and Mortal Kombat: Annihilation. 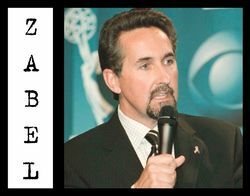 Zabel was also elected chairman/CEO of the Academy of Television Arts & Sciences. ← 30 Day Raw Food Challenge Join Us!